Professional SOLIDWORKS 2017 training tutorials that teach best practices, expert level skills, and shows you all the steps. "TEDCF your SolidWorks courses are great and in the future when my resourses are better I would like to also purchase the Inventor courses from you as I am now unemployed and looking for design-drafting work." Gary is right. We cover all the details to asure you receive the best training we can supply. We take you though a step by step training procedure that builds a strong foundation. Once you have that foundation under your belt, we take you to the next level. We continue constructing your knowledge until you’re ready for anything. How do we know we can teach you effective skills? Our sister company is The Engineering Department Consulting Firm. This is where TEDCF Publishing was born. We do the same work you do. We design and develop products and we pass these skills onto you. We know what to do to be productive and we know what will and won’t work. When you finish our courses, you will too. 3D-CAD can significantly increase your productivity, but you need to know the details about how the commands work and how best to use them. We take this one step further by showing you how to work effectively. Our courses strike at the heart of this problem by progressively building a strong foundation of skills, and then we build on top of that foundation. Ultimately, we show you how to maximize your productivity and the quality of your work. Learn how to test the stress of your parts. Discover best practices and how FEA works. 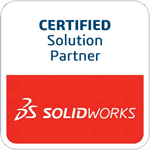 There are many advanced concepts taught in this course, so it’s important to have a strong foundation of skills in SolidWorks 2017 when you begin. This course has over 3 hours of instruction.